Ro-Yoga: 2nd birthday party for the Yoga Room! 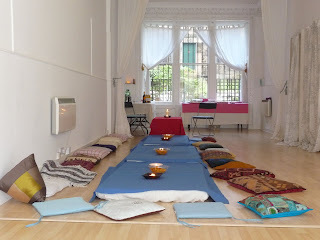 2nd birthday party for the Yoga Room! On holiday at last! I am looking forward to a week in the highlands next week. Thanks to all who came to my party; what a wonderful night it was. Also, a big thank you to the belly dancer Shelly and to Layla who created all the wonderful food. Anyone that was impressed with the culinary delights on Saturday should definately come on the retreat in November, Layla will be cooking up a storm on that as well. I have had lots of enquries in the past week, so please book soon to ensure a space. The Autumn term is pretty busy already - thank you all for your prompt booking. I am heading North next week for a well earned break, so see you all in a fortnight!